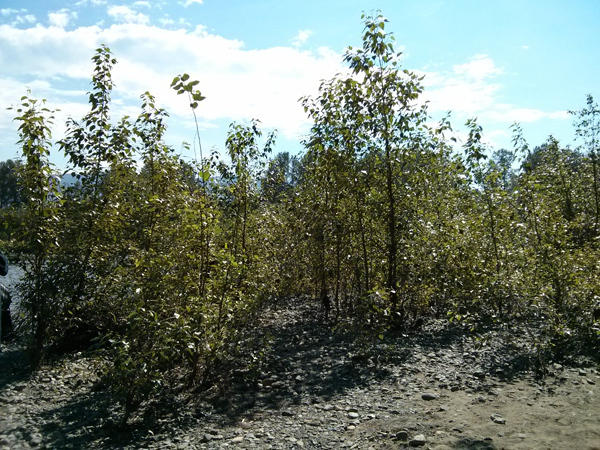 Sharon Doty, an associate professor at the University of Washington in Seattle and chair of the Environmental Applications Working Party of the International Poplar Commission, has been studying nitrogen fixation by bacteria living in poplar trees. After more than 15 years of work, her lab has demonstrated that poplar trees growing in rocky, inhospitable terrain harbour bacteria within them that could provide valuable nutrients to help the plant grow. Their findings were recently published in the open-access journal PLoS ONE. Read the article. The conventional understanding is that nitrogen fixation happens primarily in bacteria-rich nodules on the roots of legumes and some other plants such as alders, and not in the leaves of trees. However, Doty's research provides the first direct evidence that nitrogen fixation can occur in the branches of trees, with no root nodule required. This could have significant implications for common agricultural crop plants. The microbes the team has isolated from wild poplar and willow plants help corn, tomatoes and peppers, as well as turf grasses and forest trees to grow with less fertilizer. This news item is based on a news release by Michelle Ma from the University of Washington. The full news release can be accessed at http://www.washington.edu/news/2016/05/20/bacteria-in-branches-naturally-fertilize-trees/. A related news release, also by Michelle Ma from the University of Washington, describes Doty's findings that naturally-occuring microbes, called endophytes, can help poplars and other plants to better tolerate drought and other stressors. This work has recently been published in the journal Current Plant Biology. A related article, by Kaine Korzekwa for the Alliance of Crop, Soil and Environmental Science Societies (ACSESS), has been published on the websites of the American Society of Agronomy, the Crop Science Society of America, and the Soil Science Society of America. The article, entitled 'Probiotics - for plants', describes the findings of Doty and her lab and their potential practical applications. This story can be accessed at https://www.agronomy.org/science-news/probtiotics-plants.